A venous leg ulcer (VLU) is caused by vein disease that primarily affects older adults. As a prevalent problem among older patients, providing care for individuals with VLUs is time-consuming and costly. The direct costs vary from country to country, with reporting numbers of €800 monthly in Germany.1 Statistics report $2,500 monthly in the United States per patient,2 and given the chronic nature of VLUs, the cumulative costs per patient increase rapidly. A VLU is an open skin lesion of the leg or foot (gaiter area) that occurs in an area affected by venous hypertension. Generally speaking, the ulcer must be present for at least four weeks before it is considered chronic and a VLU.2 This article provides an overview of the etiology, risk factors, symptoms, and characteristics of VLUs. VLUs generally occur in individuals with chronic venous insufficiency (CVI), a condition that also results in varicose veins and skin changes. Both reflux and obstruction are contributors to CVI, and although reflux has a higher prevalence in patients with CVI, obstruction from secondary venous disease and valvular reflux contribute to a more rapid and higher change of progression of ulceration.4 The condition leads to increased ambulatory pressure. Chronic VLUs are the most common wounds seen in health care settings. This wound type is very time-consuming, challenging, and a burden to health care costs. Effective VLU management should include partnership with the patient when deciding on the best treatment to prevent recurrence. Essential management strategies will help aid in edema management and healing outcomes. 1. Van Gent BW, Wilschut ED, Wittens CW. Management of venous ulcer disease. BMJ. 2010;341:1092–6. 2. O’Donnell TF Jr, Passman MA, Marston WA, et al. Management of venous leg ulcers: clinical practice guidelines of the Society for Vascular Surgery and the American Venous Forum. J Vasc Surg. 2014;60(2):3S–59S. 3. Mosti G, Iabichella ML, Partsch H. Compression therapy in mixed ulcers increases venous output and arterial perfusion. J Vasc Surg. 2012;55(1):122–8. 4. Labropoulos N, Gasparis AP, Pefanis D, Leon LR Jr, Tassiopoulos AK. 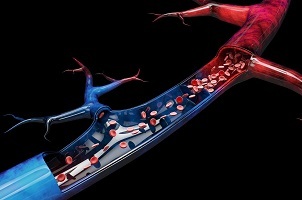 Secondary chronic venous disease progresses faster than primary. J Vasc Surg. 2009;49(3):704–10. 5. Anwar MA, Georgiadis KA, Shalhoub J, Lim CS, Gohel MS, Davies AH. A review of familial, genetic and congenital aspects of primary varicose vein disease. Circ Cardiovasc Genet . 2012;5(4):460–6. 6. Zamboni P, Tognazzo S, Izzo M, et al. Hemochromatosis C282Y gene mutation increases the risk of venous leg ulceration. J Vasc Surg. 2005;42(2):309–14. 7. Carpentier PH, Maricq HR, Biro C, Ponçot-Makinen CO, Franco A. Prevalence, risk factors, and clinical patters of chronic venous disorders of lower limbs: a population-based study in France. J Vasc Surg. 2004;40(4):650–9. 8. Rai R. Standard guidelines for management of venous leg ulcer. Indian Dermatol Online J. 2014;5(3):408–11. 9. Harding, K. Simplifying venous leg ulcer management: consensus recommendations. Wounds UK. 2015. Available at https://www.wounds-uk.com/resources/details/simplifying-venous-leg-ulcer... [Accessed January 9, 2019].